and it had never occurred to me to contemplate the word in a more general sense. What does it mean for something to not just be a medium, but to be medium. We use medium to describe a state which is between two extremes such as medium loud or quiet, medium full or empty, medium soft or hard. It is an average between the two extremes. It is a line of best fit which allows to convey a fictional state of middle. It is merely a convenient and descriptive approximation of some particular state. When considered in relation to communication this definition becomes quite interesting. It means that the medium is in the middle, not only as the tool of communication but also as a descriptor of the information/data/sound/feeling/emotion being communicated. This connection emerged from a discussion of the nature of intuition. Intuition is the ephemeral sense or idea that occurs in a composer/artist/architect/human as the result of a non-rationally/non-linear thought process. So in order to communicate this state it must be rationalized/formalized into a symbolic carrier/medium. The intuitive sense is then distorted and molded into the shape of the medium the human (thinker) is most adept at (be that poetry, painting, sculpture, music, architecture, what have you) in order to most accurately approximate their own sensation and convey it to other humans. The receiving human, however, must absorb the message encoded in a particular medium and then recreates the sense derived from the closest approximation of the creator. When describing this thought in the forum on monday I used a poet/poetry analogy. The poet has an intuition which is ephemeral/in the mind and wants to share it. Thus they must rationalize/formalize the intuition into a poem. The poem is only an approximation of the initial intuition as a result of converting it into these symbols we call words. The words are limiting because they carry certain connotations and conceptual foundations which are not all encompassing. The reader/hearer of a poem then only experiences the poet’s best approximation (a middle or medium guess/formalization). A good poet is simply better at approximating their thoughts than a bad poet. In this same line of thought it could be argued that what we call “abstract art” is the least conceptually abstract art ever created. 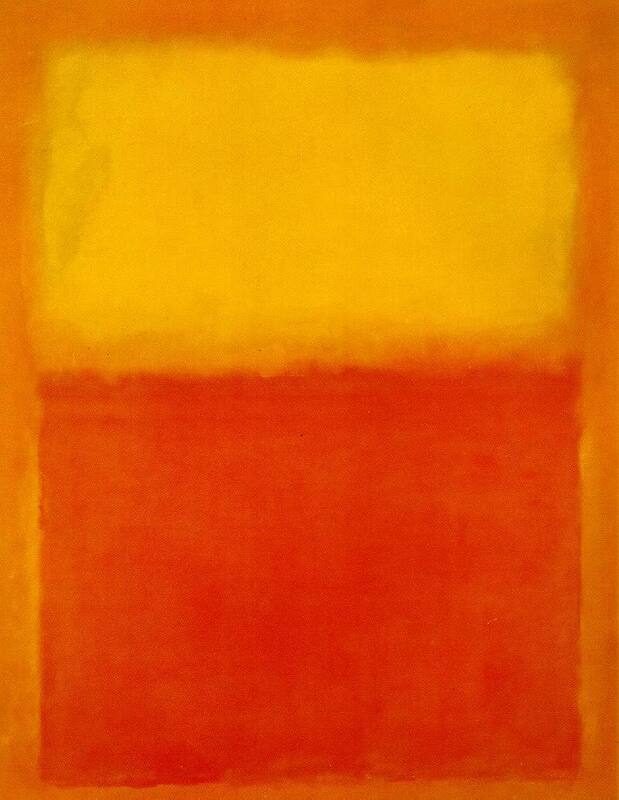 It draws on shared human senses to convey most accurately the intuition of the painter, in this case Mark Rothko. Perhaps it is the shared experience of sunset or the globally observed connotations of red, but to even attempt to explain or define the painting is to put it in a formalized box, an approximation of my own. It must be experienced. I am an architecture undergrad @ Virginia Tech with an interest in emergent and interactive design. I think that Rothko is particularly aware of the limits of a medium due to its very definition that it must mediate, or be in the middle, of a dialogue with the observer so he does simply try and co-create his work with his audience. I think that his work is a comment directly at this nature of medium, focusing on what is there (in his mind) rather than what it looks like (to the “rational” human). I think this suggests why artists have culturally moved away from hyper realistic paintings. A photographic copy is better suited to the art of photography as a particular medium whereas painting possesses other qualities inherent in the medium. The computer, as a tool, has the potential to be all mediums, however, some of these media are still more appropriately worked with outside of the computer (for the time being). There is also the potential within the computer to dream up fantastic new media which bear no resemblance to an analogue medium (the gif, I am sure, is just the beginning of computer specific media). That being said, all art does involve the act of co-creating. I think that interactive art is really interesting because the result of the work is tied to recent actions generated by the observer. It is a really recursive thing, watching yourself generate art about yourself generating art. In this way the artist can use the interactive medium to call attention directly to certain attributes of the observer. In a way, it is the closest we have come to direct thought transmission because the content of the medium is contained within the observer so there is no medium condition. The artist just creates the conditions for an experience. I wonder, if I were theoretically able to convey my thoughts directly, sans medium, if they would be more or less powerful. Perhaps this is what Simak was trying to get at in “Immigrant”. The aliens brought the humans to their planet to learn about what it means to communicate with symbols. They loved one of the girl’s paintings (even though they were, in her opinion, not very good) because they were an experiential puzzle that could provoke thoughts/feelings in them that were not transmissible through direct thought connection. This is what I was trying to say. The measurable means are inherent to medium considered both as a thing and as a conceptual place. I was not trying to suggest that this in any way detracts from the value of art by “tending towards mediocrity”. It is an absolute necessity, but it is great that you point out that it can produce “plussy” effects. I definitely missed this aspect. As is often the case, it is eerie how well topics in this class line up in class(es) I’m teaching. It just so happens that in ece3704, which I have been “guest” teaching the past week, we have been discussing the effects of sampling a continuous time signal (often found out in the “real world”, this is the stuff we care about) into a discrete time signal (necessary when doing any type of calculations on a computer). Effectively the process of sampling maps an infinite space onto a finite interval and so it becomes clear when looking at the math that there will necessarily be something lost in that transformation. Of course, there’s also a bunch of theory involved that can tell us just how much is lost, and just how many samples you need for a given signal in order to gain a “perfect” representation. But even then, while mathematically tractable, there are physical restricts involved with the reconstruction process, namely, to perfectly reconstruct the continuous time signal from its samples one must have knowledge of ALL future samples, clearly not feasible. I had never thought of the daily communication we do in the same context, but it is a perfect fit. Every attempt to communicate we are essentially mapping an infinite space (the full range of feelings/thoughts we experience) to a finite interval (limited by the number of words we know, and the rules of grammar), and we hope that the person receiving that lossy, sampled version can reconstruct our original thoughts with some degree of accuracy. As far as I know though, there isn’t any established theory that can tell us just how many words we need to use for any given thought. Does it even make sense to ask that question?